by Brianna Crandall — May 2, 2018 — The rise in active shooter incidents and the escalating impact of hostile events has prompted the global nonprofit National Fire Protection Association (NFPA) to fast-track NFPA 3000, Standard for Preparedness and Response to Active Shooter and/or Hostile Events, as a provisional standard, which means it will be available for use as of May 1, after a round of public input ending February 23. This marks only the second time in NFPA’s 121-year history that provisional standard status has been authorized by the NFPA Standards Council. Provisional standards are developed when there is a serious life safety concern that warrants an abbreviated standards development process so that a standard can be issued in a shorter time period in the interest of the public, and, in this case, first responder safety. The tragic trend of hostile events in the United States prompted this authorization. Read NFPA President Jim Pauley’s February 19 statement following the shooting at Marjory Stoneman Douglas High School. Although this standard will benefit authorities around the world, mass killings are largely a US phenomenon, according to NFPA. With just five percent of the world’s population, the US holds the unfortunate title to 31 percent of all public mass shootings. Over the course of nearly 17 months from June of 2016 until early November 2017, a trio of domestic perpetrators inflicted nearly half the casualties that the nation witnessed during the course of a thirteen-year period from 2000 through 2013. A shooting at the Pulse Nightclub in Orlando, Florida, left 49 dead and 58 wounded on June 12, 2016; a massacre in Las Vegas, Nevada, on October 1, 2017 killed 58 and wounded 441; and less than 35 days later on November 5, a gunman took the lives of 27 and injured 20 more in Sutherland, Texas. 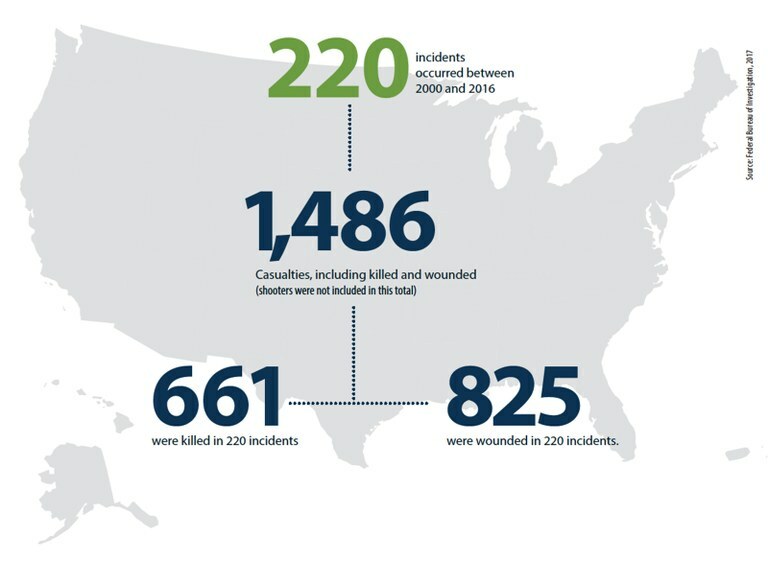 These numbers reflect a dramatic increase based on the 160 incidents, 486 deaths and 557 injuries (not including suspect injuries or deaths) documented by the FBI during the years 2000 through 2016. Hostile events are happening with greater frequency and ferocity today. It’s critical that we take steps to protect people from this increasing threat. By employing the unified response outlined in NFPA 3000, first responders, facility managers, hospital officials, and community members can minimize risk before, during and after these devastating incidents. We were clearly hearing the need for such a standard from those on the frontlines. Through this process, we are able to respond quickly to provide a critical body of knowledge to those who are faced with such horrendous events, ultimately making them and the public safer. NFPA 3000 establishes preparedness, response and recovery benchmarks with a focus on integrated protocol, and civilian and responder safety. When issued, the active shooters standard will provide guidance for organizing, managing, and sustaining an active preparedness and response program so that the risk, effect, and impact of hostile events can be reduced. The proposed standard addresses all aspects of the emergency process, from identifying hazards and assessing vulnerability to financial and facility preparedness, planning, resource management, incident management at a command level, competencies for first responders, and recovery procedures. Efforts to establish NFPA 3000 began in October 2016, shortly after the Pulse Nightclub incident. A new NFPA Technical Committee comprised of representatives from the Department of Homeland Security; Department of Justice; the FBI; NSA; national police, fire and EMS organizations; hospitals; private security; and universities, was quickly formed. Initial public comments on the issue were gathered in just four months; the NFPA Standards Council unanimously approved the new standards project; and development of NFPA 3000 began in June 2017. Follow the development of NFPA 3000 via updates as soon as they are available. For information about NFPA Journal’s upcoming coverage of NFPA 3000 or to view the links above, visit the NFPA website. See also the FBI’s “Quick Look: 220 Active Shooter Incidents in the United States Between 2000-2016,” including graphs of the statistics.